Gadsden High School is mourning the loss of one of their baseball players. Adalberto “Beto” Romero was killed Wednesday in a hit-and-run accident. Romero was a sophomore player on the team. 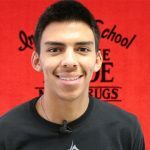 According to a Sheriff’s Office news release, Romero was killed when a driver allegedly ran him over as he was getting into his car to go to school. On Friday, the baseball team held a memorial ceremony on the field before their game against Alamogordo High School. Friends and family members were in attendance. Romero’s father threw out the first pitch the game.